Mahachai is a small town located in the Samut Sakhon province of Thailand, about an hour drive from central Bangkok. On the drive there, you barely even leave city, but once you're there it definitely has a much smaller and more country feel to it than bigger Bangkok. Mahachai has one of the largest fresh seafood markets in Thailand, and it's one of the main seafood distribution centers that caters to the hungry population of Bangkok. Seafood producers from around the country go to Mahachai to sell their catch, which is then bought and sold to seafood dealers. As soon as you arrive in Mahachai, and step out of the car, you can actually smell the light whiff of seafood in the breeze. For seafood lovers, this is a dream come true! 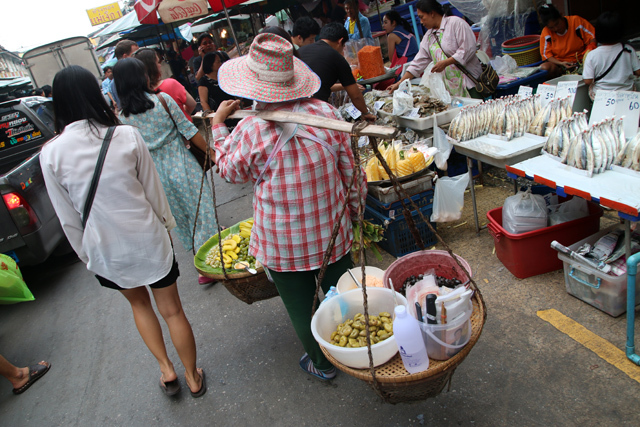 So the other day I met up with a friend and we decided to head to Mahachai to take a walk around, check out the market, but mostly to take advantage of the seafood restaurants that are plentiful and delicious. We ate at a restaurant known as Ran Ahan Pi, a legendary local seafood restaurant that is tucked into the neighborhood and housed in a home transformed into a restaurant. The entire assortment of Thai seafood dishes, including quite a few unique house-made specialities, were on the menu. The restaurant owner is known to have quite a personality, and as the story goes, when someone ordered an omelet with rice, he threw a fit of anger and told the customer to leave his restaurant. The bottom line: you go to eat seafood, and seafood only. No chicken or omelets. We ordered butterfly cut shrimp soaked in chili flakes, fish sauce and lime juice, squid stir fried with salt cured egg yolks, and a crispy deep-fried fish served with sour green mango sauce on the side. Everything was fresh and amazing. Despite our stomachs being so full we could barely walk, we decided to go for a stroll though the main Mahachai seafood market. It was the middle of the day, so the main commercial seafood trade was finished for the day, but there were still plenty of vendors selling seafood on an individual basis. Both fresh and dried seafood were displayed in huge quantities. 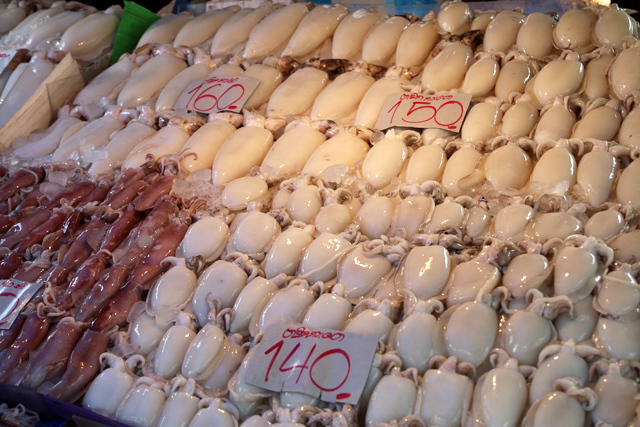 The squid in particular were neatly laid out in rows according to grade and size. There were also dried squid, wrapped up in bags to snack on, and additionally, there were vendors all over the place selling temptingly fresh grilled squid on the side of the road. If you like squid, you'd surely enjoy a grilled jumbo squid on a stick. 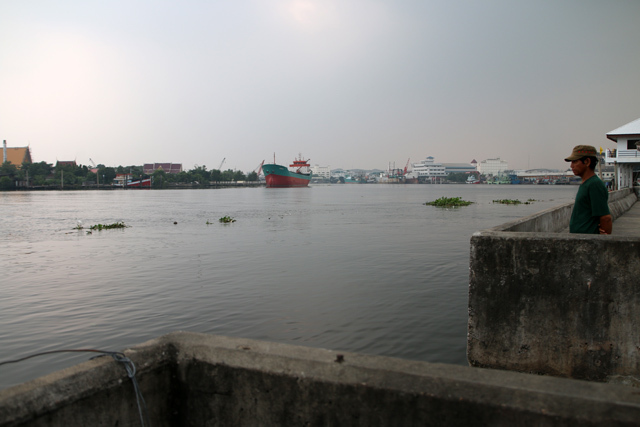 Walking along the river in Mahachai we enjoyed the faint smell of seafood paired with plenty of interesting sites. 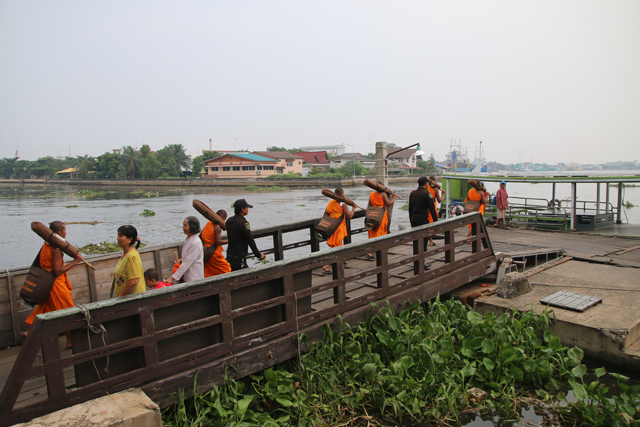 We spotted a group of monks, dressed in their finest orange ceremony robes, boarding the ferry to go to the other side of the river. We passed both Chinese and Thai temples, and saw all things from the sea in huge quantities. 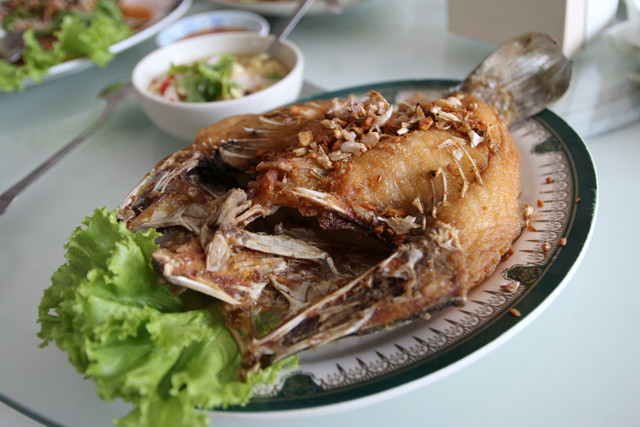 Mahachai is an off the beaten path destination that makes a good place to explore and eat seafood. Hi Mark, what should I type into Maps to find the seafood market? I enter mahachai market but no market was there ? Hi, I’m from Thailand and Mahachai is my hometown. The easiest way to find the market is searching for Mahachai railway station. The seafood market is the road next to the station.